On October 10th, 2015 I set off to capture Mt. Langley, my second "14er" (mountain 14,000' or more above sea level). My first one was Mt. Whitney, the tallest of them all, which I've done twice actually. California has thirteen 14,000'+ mountains, or fifteen if you get all technical. Mt. Langley rises 14,032' (4277m) above sea level in the crest of the Sierra Nevada. 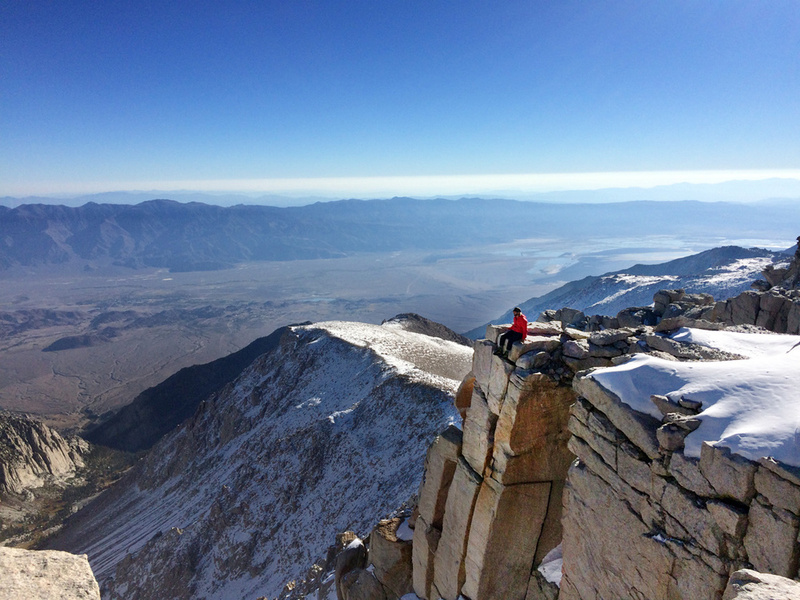 It is the ninth highest peak in the state and the seventh highest in the Sierra. Langley is often regarded as one of the easiesr 14ers to ascend, but hey that's sort of an oxymoron! This type of trip really embodied the "weekend warrior" spirit; head up early Saturday and come home late on Sunday, then back to work on Monday! Was rough finding participants down for this type of adventure (can you blame them??) so Jaime, a fellow Sierra Club leader, and I headed out in a team of just two. We left Los Angeles at 6am sharp and headed to Lone Pine. First stop was the Eastern Sierra Wilderness Agency to pick up our permit. We chatted with the rangers about the recent snow storm, heard about the prior weekends Search & Rescue missions on Whitney, the S&R trip to fly someone off Mt. Langley due to frost bite, and then we exited, empty handed, thru the gift shop. We grabbed our final provisions on the main street of Lone Pine then made a beeline to Horseshoe Meadows. The trail head starts at 10,000' so it's quite the drive up. We stared Mt. Whitney right in the face on the car ride there (tallest peak to the left of the road). It was 11am when we suited and booted to hike in. The parking lot was surprisingly crowded for a mid October weekend, but the weather was good, and many last minute decisions to squeeze one more trip into the back country were to be made! 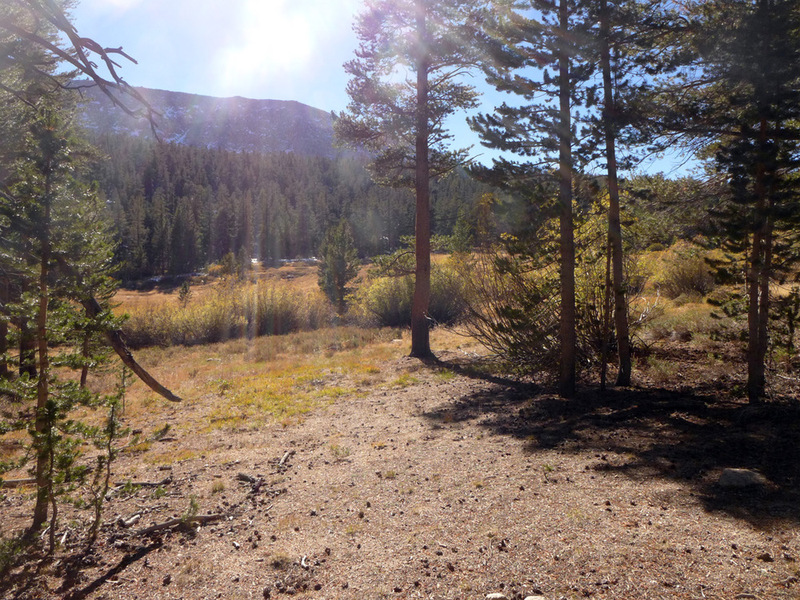 The plan was to enter from Horseshoe Meadows, take a mellow trek to Long Lake (6ish miles) and set up base camp. From there we would have an alpine start the next morning and make our bid to the summit. The hike was very laid back. It was warm and only 1000' of gain on the way to camp. As we got a little higher and hit more of the north facing bends and curves some snow showed up. There was a huge snow storm the week before, so it was a gamble if we'd make the summit. Alas, we arrive at Long Lake sooner than we even expected (a great theme for the weekend). It was 3:30pm, which would give up plenty of time to set up camp, enjoy Inyo National Forest and prepare for an early next day. After getting organized, water filtered, pack unpacked, summit packs repacked and all the tedious organizing these adventures require, I cooked up some back country Starbucks Pumpkin Spice Lattes #PSL! Was a good pick me up after getting up at 5am and I needed the boost. I joked with Jaime about my three objectives to squeeze into a one-night trip. 1.) Catch the elusive California Golden Trout, 2.) Photograph the Milky Way, and 3.) Summit Mt. Langley. High expectations but if you've met me you know I'm an enthusiastic busy body. CHEERS, WILL ANY OF THIS HAPPEN?? I am not much of a fisherman, but I do love it. I was banking mostly on beginner's luck. I was also banking that the area is known for holding Golden Trout, especially because it is regulated only to catch and release fishing. Not to mention, you have to hike 6 miles to get to the lake, so that weeds out the lazy people right away. 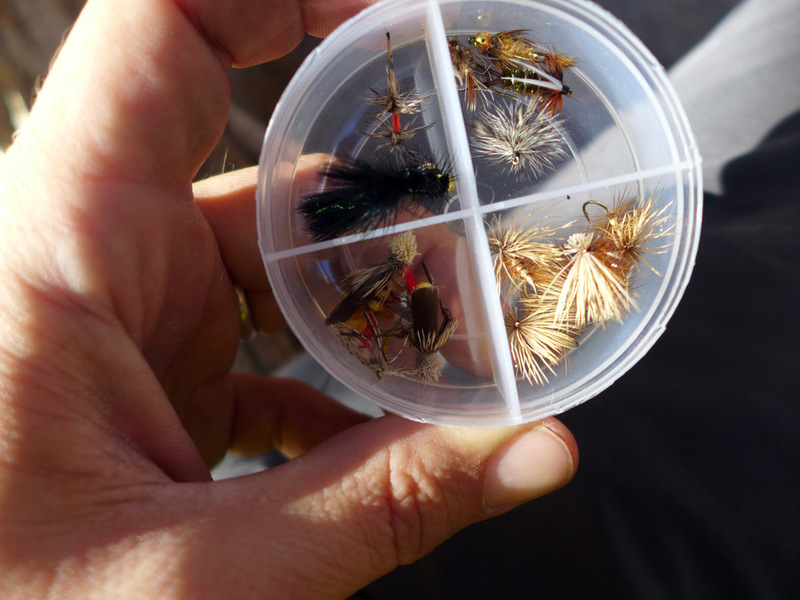 I only brought a little back country pole with a water bobble and added a few feet of tail to tie a midge fly on. The trout in high Sierra lakes are tiny, often less than 10" sometimes 8." The Golden Trout is special, not only is it the state fish of California, but it's also incredibly beautiful and hard to find. The staging area for a Mt. Langley ascent is known as the Golden Trout Wilderness, so this is the spot look. Be it Cottonwood Lakes, or Long Lake or High Lake or any of the tributaries, this this where you press your luck. It was approaching dusk and I thought the stars would align. However it was mid October and getting cold, there were no mosquitoes in sight, so why would the fish be looking for my bait? There was also a bizarre and excessive amount of birds on the lake, were they scaring the fish?? There were a few others fishing the lake and nobody got even a bite. Fishing is sort of zen, it's exciting to land them, but just starring into the water is the main reason I do it. So of the three objectives, I crossed "catch a Golden Trout" off the list, but this just gives me a reason to come back here with my family. I'll find you one of these days! It's fall and sunset is around 6:30pm, I packed up the pole and cooked up some warm dinner. Next goal was to shoot some night photography. I noticed the lunar calender was lending itself to a sliver of a moon, which would fair optimal for shooting the stars. I downloaded a sky guide app for locating constellations and gave it a go, again hoping for some beginner's luck. I have a mediocre camera, it's between a smart phone and a SLR, but I can adjust the exposure length, and adjusted it to a couple minutes. I took a few photos. It was 9pm and I wasn't going to be able to stand around in the cold waiting for this experiment too long. I also wasn't going to be able to stay up much later, I had an early rise this day and planning tomorrows even earlier rise! I'm not sure if this crossed off the objective, but it was closer than landing any trout. I joked that I should have carried in a tripod instead of a fishing pole! You got to start somewhere I guess. I woke up at 3am, to give myself a "casual" start. I made a warm breakfast of fancy oatmeal and broke out the AeroPress. There nothing that's going to happen without coffee first! 3:30am inverted AeroPress brew with Ruby Roaster's Kenya Gachatha single origin beans. The juicy flavor profile ranges from Bing cherry to apricot and mango. SERIOUS BUSINESS, this isn't a game, this isn't Starbucks instant sugar latte junk anymore. 4am, hit the trail in total darkness, remember there was hardly any moon anyway. We headed up New Army Pass. Parts of a trip like this are best done in the dark, because you can forget how miserable they can be. We ascended the long switchbacks before we became really conscious. I know it seems crazy to start this early, but we have at least 15 miles to hike this day, plus a 4+ hour drive back to Los Angeles and work the next day! No time to waste! You can barely see Jaime's headlamp lighting the trail and mine too. It wasn't til our return did I even realize how steep and thin the trail was up here. Ha! We had projected a turn around time of noon, if we couldn't get the summit before than, it would be time to go. We arrive at the top of New Army pass, way ahead of schedule, can't remember exactly but I think maybe 5am? We were pretty pleased. However we were also about to embark off trail and that meant night time navigating. Jaime took the reigns on the navigation (everyone knows my tendency to get lost) and she shot some bearings on the map and we headed North down the other side of the path, and then a little northeast. Sunrise wasn't slotted til near 7am so we'd be in the dark for more cross country hiking. When first light appeared it was stunning. First light doesn't actually mean sunrise, but it's coming. We kept on trucking, now in the snow. Now at a higher altitude and getting colder. Come on sun!!! AAAAAAAAND SUNRISE! Bam, gorgeous. What a show! Finally we could turn the headlamps off! The alpine glow you can experience in the mountains is amazing. It is real! I've best witnessed it around Mt. Whitney at trail camp when the tops of all the mountains look pink and glow red. We were so high up, we got showered in it. Here you can see Jaime just blanketed by the alpine glow. As we got closer and closer up Mt. Langley the snow was heavier. It was rumored people had given valiant attempts the days prior (most being turned around from the deep snow and lack of time) you can see their post holed foot prints. For us, it was so early in the morning and so cold and high up, the snow was very hard, fortunately we didn't have to break tracks. Which takes forever and drains extra energy, a major cause of the failed summit attempts earlier in the week. We got to a stage where crampons and microspikes would be best. This trail, when done in the summer can be a real slog of loose scree and dirt. We were able to take advantage of the season's condition. A risky time of year, but the snow had hardened, not to ice yet, but enough to helpfully travel over the scree. We put on our snow tools and snuck passed the troublesome areas. When you plan a trip up a 14er in the middle of October, plan for anything, plan for everything and plan to accomplish nothing. Bring all the gear you hope you won't need. Plan on a storm sending you home early, plan on it might not happening. Hope for the best, but keep expectations low. We really got blessed. It was a weekend after a terrible storm and a weeks worth of heat wave since the snow came in, it gave us the perfect terrain to ascend the mountain. Here I am below, coming up and over the ridge line. We done did it! We got to the summit by 9am, well before our projected goal (10am?) and 3 hours before our safety turnaround time of noon. For the life of us we could not find the registry box to sign in (maybe it was under some snow??) 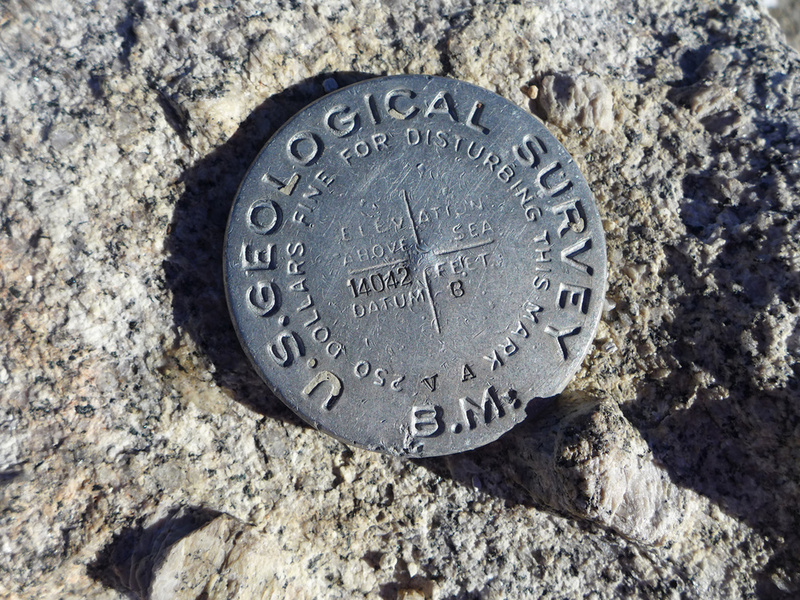 but we did find the U.S. Geo Marker. 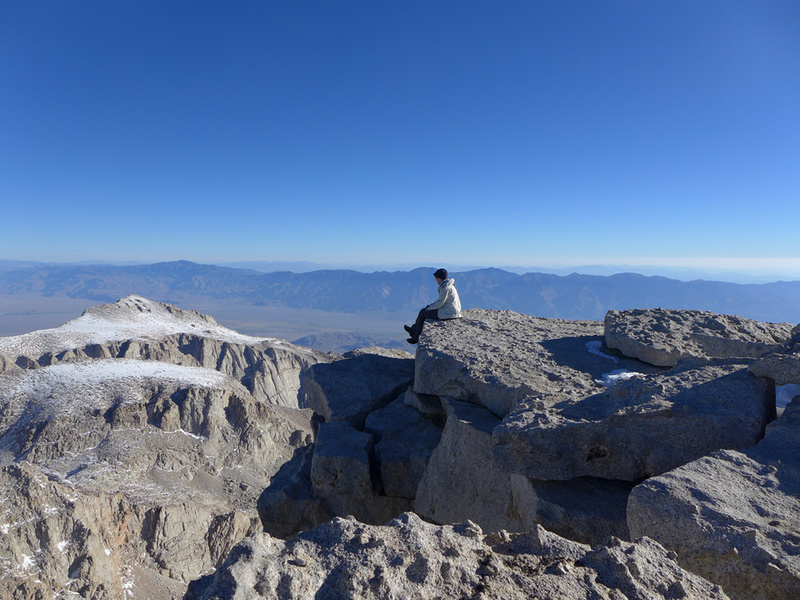 When we arrived we had the summit all to ourselves, it was splendid, high visibility, warm temps, amazing view. We had some snacks and were shortly joined by a solo trekker also from Southern California. He was kind enough to shoot our summit capture, CHEESE! Our speed bought us a little more time to celebrate and chit-chat at the top. We had an early lunch (not really early because I had been awake for 6 hours already) Then we shot a few more photos. Here's Jaime on the cliffs edge of the true summit to Mt. Langley. and here I am sitting on a sheer face cliff adjacent. The views were just palatial and humbling, hard to turn away. We took one more peek off the summit and had to head back to the real world. Being at the summit means your trek is only half way over, you still need to get back home! As we headed down the snow was softening up. We scooted down Langley and had to head back up New Army Pass and down to Long Lake. Heading up the pass almost broke my spirit, it had been so much work just to get this far. However on the way back to base camp we saw a Bighorn Sheep just looking majestic as can be, can it can any better? The sheep are protected in the area and appeared to be wearing a collar. It's the rangers request that sightings be reported to the Department of Fish & Wildlife. We got back to camp around 1pm, just really tired. My feet were barking! We took a pretty short break to eat anything left and then break down the tents. Pack up the monster bags and head the 6 miles back to the car. We left camp around 2pm on Sunday. The walk back to the trail head was quiet. We were zoned out. Mile 14 and and 15 just never ended. We maybe took one 3 minute break back to the car. It took us about 2.5 to 3 hours to get back to the car. 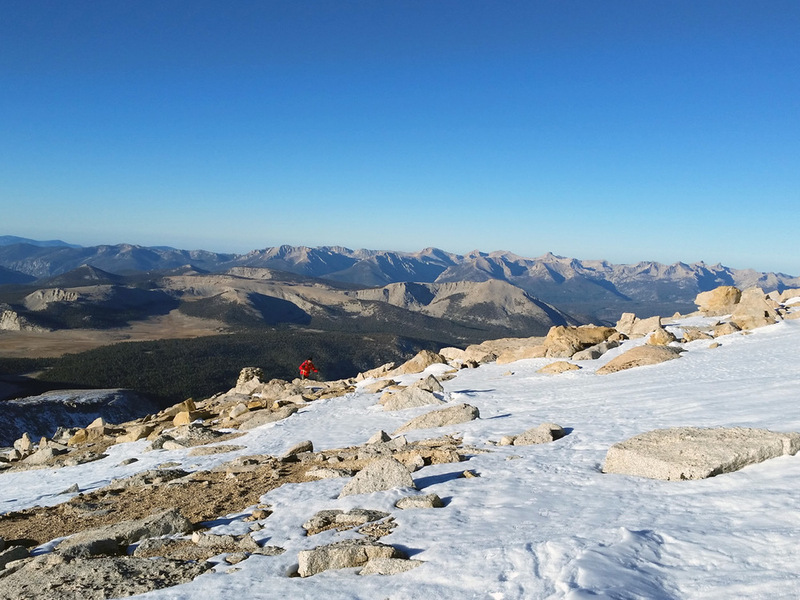 I did my best to enjoy the landscape of the John Muir Wilderness on the way back. I snapped this photo of a meadow, just lovely. We headed down the mountain road from Horseshoe Meadow, stopped at the Pizza Factory for the quintessential post-mountaineering meal and then grabbed gasoline, redbull and did the 4 hour drive back to the city. Got home around 10pm and barely had the energy to empty the trash from the bear can and take a quick shower. If was a savage weekend, but really fun! I don't see a shot at any more 14er's this season, but when spring roles around it's back on! !